That Alex Davis is currently deeply influenced by all things African is evident—the new doorstopper for his kitchen is a small wooden giraffe, and on one wall of his living room hangs a large red feather hat, the kind worn by a tribal chieftain in Cameroon. 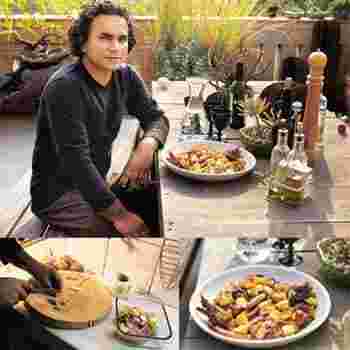 He owns a three-legged cast iron pot called poyke used by South Africans to make stew and, on top of this, the 44-year-old product designer’s wishlist for his kitchen includes “a family of tagine pots used in north African and Moroccan cooking". Davis is not a flamboyant cook but he is methodical. An hour before our scheduled meeting, he calls to say that the Pollo and Patata Bake with Pork Sausages, a staple on his annual Christmas lunch menu, will take at least an hour and a half to cook. So he proposes to ready one dish completely and keep aside ingredients for the second which he will use to demonstrate his recipe. The Davises’ annual Christmas bash usually starts at noon and goes on until evening and is always held on the terrace of their CR Park, New Delhi, home which doubles up as a studio. Davis calls the terrace “my thinking lab". It is a charming spot—a perfect place to host an afternoon party with about 20 couples and children walking in and out all day long. On one side is a large glass-walled room with comfy sofas and in the open area of the terrace lies a worn-out wooden table and two benches. Along the walls are plants such as ferns, mandarin oranges, cacti, small lemon shrubs and aloe vera. “We love eating salads and so I grow rocket leaves, tomatoes, lettuce and basilico on our terrace," explains Davis. The primary dish at the bash, says Davis, is usually honey glazed ham which he picks up from Steakhouse in Jor Bagh, chicken roast, the Pollo and Patata bake which is popular with kids and adults, salads and a barbecue. “This bake is a dish I’ve eaten in many European households though I have modified it a bit to suit our tastes. It is a good filler between large courses and can be eaten even if a guest walks in at 5pm." Friends usually bring the desserts and wine. Davis says he is partial to the rum-soaked raisin cake at Steakhouse and Christmas cakes made at Chocolate Wheel, Jor Bagh, New Delhi. “The great thing about being known as a foodie among friends is that you get food gifts, especially during the Christmas season," he says, pointing to the gaily wrapped package of salmon that friends from Canada have sent. Take about 250g of pork sausages (Davis buys these at Pig Po or Green Chick Chop or Steakhouse in Delhi) and chop them to make a mince. Marinate the chicken pieces (use drumsticks or chicken breast), pork sausages, garlic cloves and the pork mince in olive oil, salt, pepper and the seasonings. Keep aside for an hour at least (“Marinating overnight works best. Keep the marinated mix in the fridge," says Davis). Cut the potatoes into wedges and fry till golden. Set aside. Make the chicken stock as per directions. Now layer the pre-heated baking dish with a little olive oil. Place the marinated chicken and sausages mix and drizzle half the chicken stock over it. Bake for about 30 minutes at 180 degrees Celsius in a pre-heated oven. After half an hour, take the dish out and stir its contents. Spread the potato wedges on top and add the remaining chicken stock. Bake again for 30-45 minutes. TIP: You can use a pint of beer instead of chicken stock. “It gives the dish a totally different flavour but it’s not a good idea if children are going to be eating this," says Davis.